CityScope Net provides e-mail services to our hosting and mailbox only accounts. While most clients will pull their email from the server directly from their pc or cell phone, it is sometimes useful to access your mail through our web mail interface, such as when traveling. We suggest clients use an email software client such as: Microsoft Outlook 2007 or higher or Mozilla Thunderbird that uses POP3 on a regular basis so you download the email to your pc. For cell phones, tablets and travelling laptops, we suggest setting up IMAP instead of POP3. ** We make daily backups of our systems, but we are not responsible for any email left on our servers or lost in transit or from any system failure that may happen whether on our servers or from our network providers. You also understand that email is not a secure form of communication. Please do not send or store passwords, credit card information or any sensitive identity information in your email. 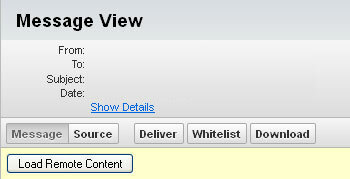 In Barracuda ESS, you have the ability to see ALL your email, blocked or sent. You can setup exempt and blocked users and change when you receive quarantine notifications anytime of the day and week or not at all. You can find Barracuda documentation on our Web Mail Support Page. CityScope Net provides a service of creating and maintaining your E-mail Newsletters and email contacts. We use either Constant Contact or MailChimp for our clients. The client pays the email provider (Constant Contact or MailChimp if it applies, they do have free accounts.). We charge only for our services of creation and maintenance. CityScope Net sells Individual Email Only accounts for $66.00 per year*, which includes Barracuda Email Security. You can use one of CityScope Net's owned domains below or we can setup your domain on our servers. All of our Web Hosting accounts have email which include Barracuda Email Security email accounts. [* Some restrictions apply, such as we may not allow adult or sensitive usernames or content. Sales tax in Texas at 8.25%).